Artistic awards series are handcrafted gifts that can be personalized. Because these are handcrafted, each award is unique. Elegant, artistic, and presentable for very rich occasions. Artistic awards are beautiful to display in any environment from the simple to the most elite locations. Artistic art based awards are timeless. Free engraving make these elegant art awards a perfect gift for any occasion. 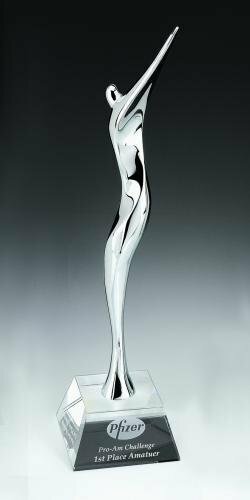 Futuristic and Modern Award with aluminum base. Three different elements creating contemporary award with large engraving area. This unique piece will stun any recipients. Skillfully hand sculpted horse head melted with cube base. It has been used for presentation by Queen Elizabeth. Stunning Golf Trophy ever! Abstract chrome plated golfer on perfectly round crystal base. The most creative golf trophy ever! Beautifully sculpted abstract chrome plated shiny golfer on simple crystal base. Any golfer will love Fantastic Golfer. Beautifully designed and crafted with chrome plated metal goddess holding crystal globe. Goddess of Universe is chic yet graceful. Flame in Green crystal with unique base. Unconventional Flame Award represents the fire that drives employees to succeed. Ishtar is sculptural prestige golf award made with highest quality crystal. Three goddesses are holding the golf and it is absolutely gorgeous award for very special golf event/tournament.